A bottle rocket launch platform with gardena connection for quick and safe release of the bottle. Pressure is added to a bottle with some water by a bicycle pump. when the bottle is released from the platform, the pressure expels the water in the bottle, generating lift. Same as usual… got bored. * A bottle (coke bottle preferred as they are sturdy). 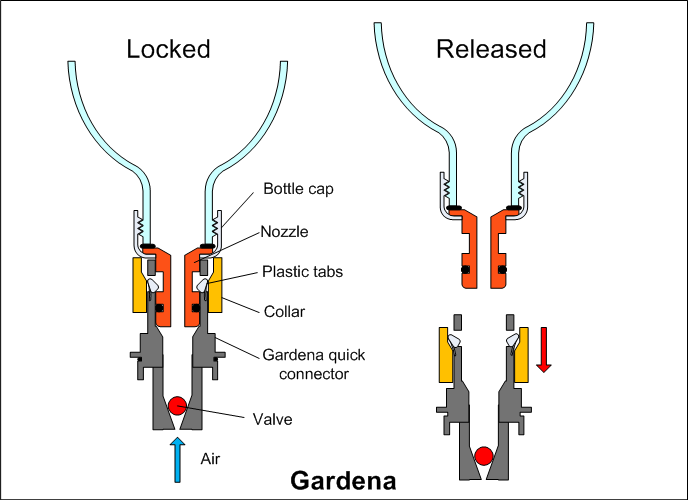 * A Gardena connector, connected to a bicycle pump (I made a small platform with the connector, a one-way valve, and some longer hose to connect to the pump). * A bicycle pump (or other pump capable of delivering around 2-7 BAR). You fill the bottle with some water, connect it to the hose, and pump in as much air as possible (be careful not to pop the bottle). Then release the bottle and watch it fly.